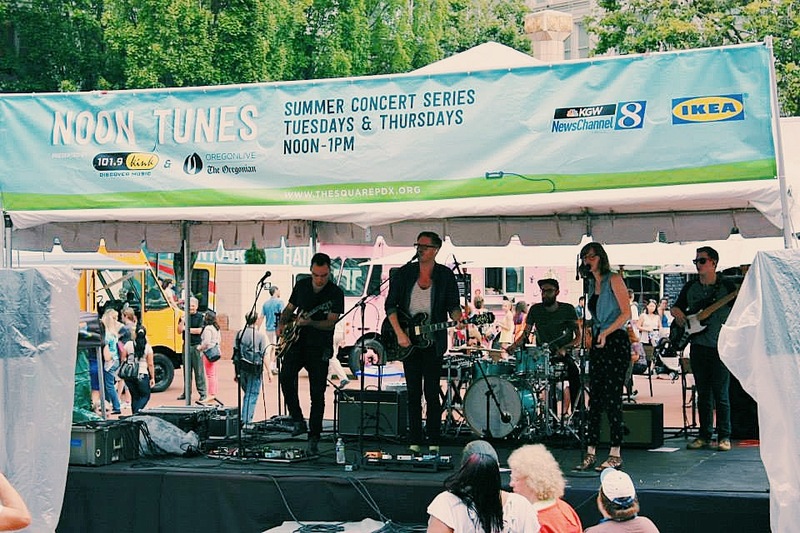 Recently I took a trip with bandmates Joel Evers (drums) and Joseph Starr (guitar, vocals) to Portland, Oregon, to play a few shows at Pioneer Courthouse Square. The square is in the heart of downtown, viewable by most traffic that passes through the city, and open to anyone who walks by. I played at KINK-hosted Flicks on the Bricks and Noon Tunes on August 8 and 12 respectively. The shows were the best I’ve ever had, and, based on feedback from KINK, potentially the best they’ve had in their summer series. The two events were extremely different, which was a great experience to take part in. For the Flicks event, we basically provided musical entertainment before the movie began, which meant we played for a crowd of people arriving early to secure a seat for the film. We had a captive audience of close to 1,000, and they seemed to love the jams. It’s been awhile since I’ve spoken in front of people. My job as a worship pastor gleaned a vast amount of performance experience, but almost no public speaking experience (primarily because I’m very anti-worship-leader-speaking). The break after the first two songs at Flicks consisted mostly of me trying to form clever sentences, which came off very disjointed and flat (feel free to laugh with me as I jeer at myself). It was not good. If any of you have seen Always Sunny in Philadelphia, it reminded me of when Dee goes to do standup and gags every time she’s behind the mic. The music was close to flawless (apart from a few wacky sound issues), and the crowd really got into our covers of KP’s “Firework,” Kings’ “Use Somebody,” and CCR’s “Bad Moon.” The speaking, on the other hand, was extremely awkward. That was the biggest takeaway from that show. I ended up selling around 40 of my CDs (out of the 100 I brought with me), and several people came up for photos with me and to share their compliments. That was the biggest crowd I’ve played in front of so far, and to hear people sing along and see others dance made the night a milestone success. The Noon Tunes show was very different, and very awesome. Even though it was for a much smaller crowd, the sound setup was spectacular. In preparation for the event, I brainstormed with friends and family about what to expect. For this show, we anticipated a lot of passers-by, and not many to stay for the entire show, since it was during the lunch hour. We had a great crowd of my friends and fans come and sit for the entire show, and about 20 minutes into it the entire square steps were filled with people listening, most of whom heard the music from afar and decided to stay and watch. People were into it. I even sold out of my CDs and got to sign some for adoring kids. A major success. People dig our music in Portland!